The way you hold a ukulele is a vitally important part of making it sound good. The uke is such a small instrument that choking all the sound out of it is all too easy. 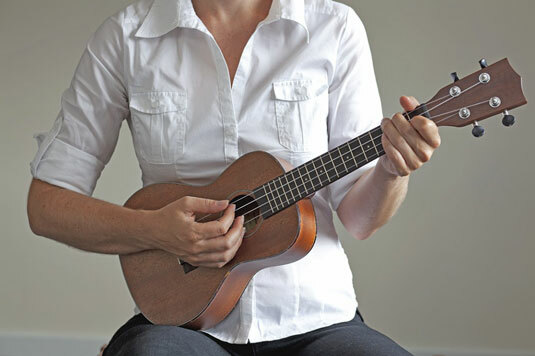 A general guideline for holding your ukulele is to try to touch it as little as possible. You want to make as little contact as you can manage without sending your ukulele crashing to the ground. Watch professional ukulele players and how they hold their instruments. Search out videos of Jake Shimabukuro and Roy Smeck for tips. Your forearm on the front of the ukulele just behind the bridge (positioned so that your hand falls naturally over the part where the body meets the neck). Don’t smother the ukulele by holding it tightly into your chest because that kills the volume and the tone. Instead, angle the ukulele away from your body so that the headstock is farther away from you than the ukulele’s body. This positioning creates air around the back of the uke, giving it room to breathe and pump out some volume. Holding the ukulele while standing up can be something of a juggling act. Each of the three points of contact has to be stronger than when you’re sitting down. Also, you may have to change the balance of the three points. For example, when you’re playing a tricky section with your fretting hand, it can’t hold the neck as firmly and you have to support the uke more strongly with your strumming arm. The smaller your ukulele is, the easier it is to hold. 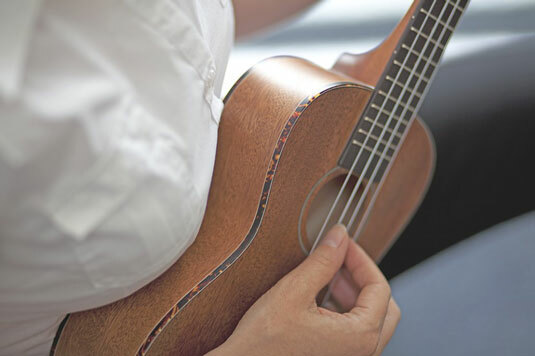 If you’re playing a tenor ukulele, you may want to use a strap. You still want to maintain the other three points of contact and you certainly still want to angle the uke away from your body. But resting it on your thigh means that each of these three points can support the ukulele more lightly. If you’re left-handed, you don’t need a special left-handed ukulele. You can just turn around a standard ukulele and flip the strings so that they’re in the opposite order. You should end up with the g-string being nearest to you and the A-string being nearest to the floor. Ukulele strings are so close to each other in terms of their width that you don’t need to make any adjustments to your ukulele. 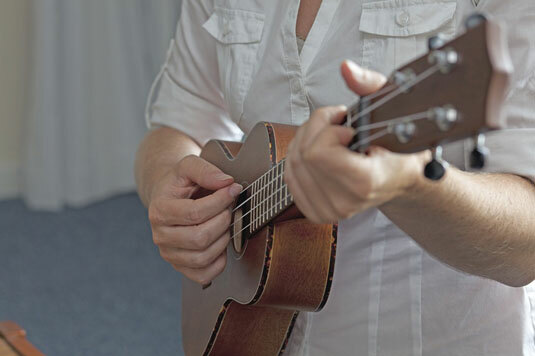 Some people recommend that left-handers just play the ukulele exactly the same as right-handers (strumming with their right hand), reasoning that both hands are required to play the ukulele anyway. But you don’t hear this argument from a left-handed person.